Showing results for tags 'songs of experience'. U2songs.com today releases the message underneath. If I understand well there will apparently be a change for the presales. This worries me. The presales for a tour worked perfectly until now. 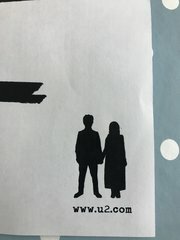 Has U2.com more information about this? "From the FNAC site... When pre ordering the album you will later get a presale code for two tickets. These will be distributed the day of the presales (FNAC site says between January 1 and March 30) and it says that U2.Com members will have a chance to use their codes first. This is a European chain, so the dates mentioned her probably refer to the European onsale dates and not the North American ones (which we are told will happen earlier.) Looks like entry into the presales could be quite different this time out. Thanks to U2start.com and U2Valencia for their information about these offers." ps: Fnac is a large French retail chain that sells amongst others cds, books and electronic products. With TJT tour over how soon until we get the new tour announced also I’ve been wondering if it will still be called innocence and experience tour and the stage and everything be the same or if it will have a different name with a completely new stage . Would you rather it be an evening with U2 or they have an opener. Also hoping they will announce a date in Salt Lake City which is where I live.